While many building owners and facilities managers understand that the cheapest kilowatt-hour is the one not consumed, most energy efficiency projects leave a lot of energy savings on the table. At the 7th Annual ACEEE Energy Efficiency Finance Forum in Chicago on May 14-15, Metrus Energy will be presenting an infographic, Which Financing Vehicle Gets You on the Road to Energy Efficiency, we created to help those in the building energy efficiency ecosystem identify the best financing vehicle for their projects. To summarize, retrofits typically compete with investment opportunities that are core to a company’s business for a share of limited capital resources. Consequently, capital budget allotments usually inhibit investments in integrated energy efficiency retrofit projects and instead favor single measure upgrades. Decision-makers overseeing retrofit projects are often restricted to equipment and systems with short payback periods, even when the addition of energy efficiency measures with longer payback periods could significantly improve overall performance. For example, a project that reduces heat loss could lead to increased cooling requirements; if it had been coupled with optimized ventilation and/or control systems, building performance would have been enhanced. Third-party financing solutions can be a better road to energy efficiency. The main third-party financing solutions for large-scale retrofits include: Efficiency Services Agreements (ESA); Property-Assessed Clean Energy (PACE); and Managed Energy Services Agreement (MESA). Each of these solutions eliminates the capital budgeting constraints for facility managers and helps managers capture the benefits of more comprehensive and integrated retrofit projects by providing 100% of the upfront capital. Managers, who consider the various financing options in tandem with, or ahead of, technical scoping, will be able to compose projects that optimize building performance, elongate the useful lives of existing equipment, even-out building-related investment requirements, and maximize energy savings. 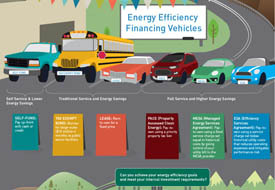 Metrus Energy created the infographic Which Financing Vehicle Gets You on the Road to Energy Efficiency to help managers understand and identify the best financing vehicle for optimal performance. Check it out and pass it along!